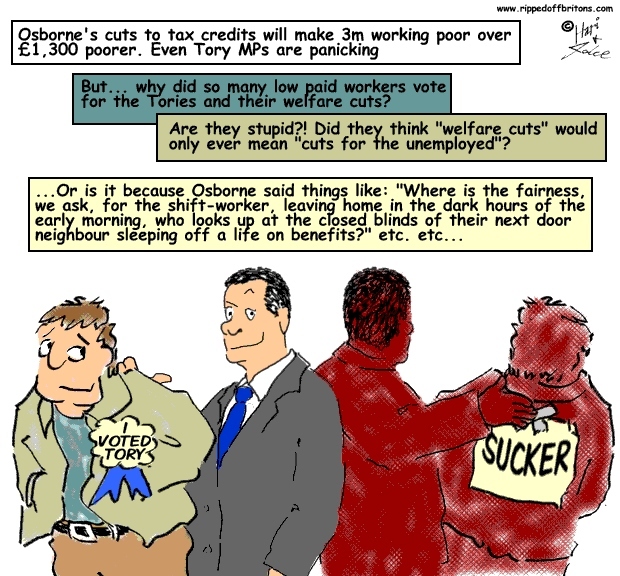 Why did so many low paid workers vote for the Tories and their welfare cuts? A Conservative MP has used her maiden speech in the House of Commons to lambast George Osborne for planning to penalise low-paid workers with cuts to tax credits. In a pointed address, Heidi Allen said the cuts fail David Cameron’s “family test” and are driven by the chancellor’s mistaken decision to run an overall budget surplus. Allen, the Tory MP for Cambridgeshire South, was heard in silence as she tore into the government over its tax credit plans. Allen, who said she decided to enter parliament after she feared that Britain was on the verge of a break up during the 2011 London riots, accused the government of naivety in claiming low-paid workers could easily earn more by working extra hours. The MP also challenged ministers’ claims that workers will not lose out if all tax and benefit changes are considered over the lifetime of this parliament. The chancellor faced further pressure to water down his plans after Conservative MPs David Davis and Zac Goldsmith signed a cross-party motion calling on the government to do more to protect low-paid workers. Remind me. How did Heidi Allen vote in the division?